This was a good read: it was a decent book with fascinating information in it, and not just because I love dogs. Though that certainly didn’t hurt. The basic idea is this: dogs are geniuses in one specific area of cognition. The book carefully and precisely documents that genius, and discusses how it came about and what it means, both for dogs and for humans. Brian Hare is a cognition expert, and has made an exhaustive study of this topic, which resulted in this book; because it was exhaustive, he studied not only dogs, but also foxes, wolves, dingoes, and New Guinea Singing Dogs, along with as many different breeds of dog as he could, all in order to test the parameters of dogs’ genius. The genius of dogs is this: dogs are better than any other species — better than dolphins, better than chimpanzees or other primates, and MUCH better than cats (Had to get that dig in there — but seriously, if you want to win every future argument about which are smarter, dogs or cats, this is the book for you) — at understanding humans. They can grasp more words, more gestures, more specifically taught abilities, than any other creature. Most interesting and most impressive is this aspect, which Hare goes into in depth, complete with cute anime-style illustrations: dogs don’t just understand what we tell them, they understand our intent. Dogs can learn to obey any gesture, from a spoken command to a pointed finger to a nod of the head or a turn of the body, so long as that gesture conveys the human’s intention. That is, if you want a dog to look underneath a box for a treat, you don’t even have to say it: you can point, or nod, or turn your body towards the thing you want the dog to do, and the dog will do it. This is actually quite remarkable, as it shows a level of empathy between species that would seem impossible for any but humans — and not even most of us. 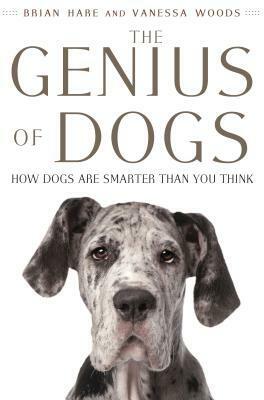 Reading about the science and the stories of dog genius was interesting and touching for me as a dog lover. I will say that the book’s writing is not genius: Hare is a scientist trying to write a popular science book (with the help of his wife, Vanessa Woods), and he doesn’t do a great job of it. The book seems self-serving at times, with Hare giving himself credit for discovering the remarkable intelligence of dogs; he’s actually being tongue in cheek, but it doesn’t come through, and you want to roll your eyes a few times. But the man knows his science, and he loves his dogs; and that’s all you can really ask for from a book, don’t you think?